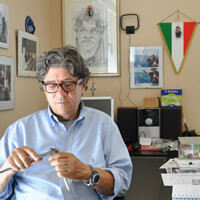 Mauro Colombardo started his business as a manufacturer in 1978. At the beginning he produced enological equipments, four years later he decided to change and focus his business on vine-growing equipments, and in this sector he could acquire high standards of specialization in a short time. Our efforts are aimed at constantly improving the equipments and therefore the quality of life of those who work in the country. We are always working with the objective of reducing the noise to the minimum and protecting the health of those who sweat every day in the vineyards facilitating their work. Currently the export turnover is about 20% of the total turnover and this figure depends on our decision to focus on the home market since very often a machine needs being optimized according to the characteristics of the land where it is used and rapid interventions can be guaranteed only in our Country. - proposing ourselves as a reliable partner for the marketing on exclusive basis of the best Italian and foreign brands.